Pony profile walking by our table on Playas de Rosarito. 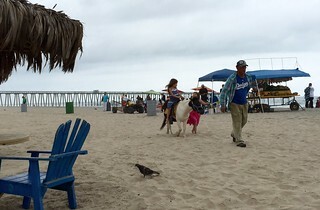 Equestrian adventures cater to tourists, young and old, in Baja California. Entrepreneurs aggressively stalked new visitors, hawking hoodies, jewelry and fresh coconut juice. At our beach club: Two-for-one cocktails, ceviche and tacos. A Salsa-version of 50 Cent’s ‘In Da Club’ (It’s Your Birthday) blasted away on the speakers. My entry for this week’s Photo Sunday: Profile.